The ancient Chavin people's religion seems to have revolved around the sacredness of nature. The people believed that at the sacred sites, such as the meeting of two rivers, they should pay tribute by building hucca, or shrines. These shrines were considered the most direct way to reach the gods, and they believed the right communication could bring fortune to the Chavin people. The Chavin priests focused on human and animal transformation. They took a hallucinogenic drug to be able to see visions which they believed were messages from the spirit world. They illustrated the priests transforming into animals or deities in the many half human half animal carvings the Chavins produced. 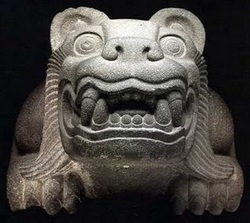 The Chavin deities were often depicted as snarling and fanged human like figures. These deities, particularly feline figures, were used in stone carvings, textiles, and pottery. The Chavin people also built a large center of religion and authority called The Old Temple. This building was meant to inspire awe. Inside, the architecture allowed for secret passage ways, travelling voices, and the jaguar like roar of rushing water. Many tricks were preformed by priests to shock worshipers into belief. Lanzón, a 15 foot stone carving, seems to have been the main attraction in The Old Temple. It depicts a half human half feline face with snake hair. 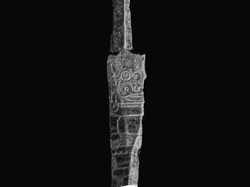 This carving most likely showed one of their main gods. As the religious pilgrim would bow down to pray to the god, a priest in the room above could reply, creating the illusion that the god itself has spoken. In about 400 BCE, the Chavin people built The New Temple, a remodeling of the south part of The Old Temple. This new space was used for events and religious ceremonies. Together, these two temples came to be known as Castillo (or castle).